Exactly 24-years ago today, an unlikely heavyweight comeback was well underway. In fact, on this day, one year shy of a quarter of a century ago, there were two unlikely heavyweight comebacks being observed – and what’s more the two come-backing heavies were about to run right into each other. Caesars Palace in Atlantic City was the venue, and a forty-something George Foreman faced a thirty-something Gerry Cooney in a fascinating (if much maligned) clash that was dubbed “Two Geezers at Caesars.” That tagline first appeared, I believe, in the late Bert Sugar’s excellent Boxing Illustrated magazine, yet a better tagline might have been “Punchers Collide.” For whatever shortcomings the returning duo that was Foreman and Cooney might have had, hitting incredibly hard was not one of them. The match-up sure caught the interest of the fans – hence the 12, 581 paying fans in attendance and the many more hundreds of thousands who had parted with some pay-per-view dollars to watch the 50-50 affair on TV. Foreman, the former heavyweight king who was 19-0(18) on his ridiculed comeback, wanted a shot at the current champ, an invincible-looking Mike Tyson – a heavyweight who was currently enjoying the kind of reputation Foreman himself had experienced almost two full decades ago, when nobody thought he would ever lose – and he thought that a win over the big and dangerous Cooney would help persuade the fans he was worthy of a crack at regaining the title he’d originally won by annihilating Joe Frazier. “It’s time to make Tyson shiver,” George said when asked why he’d departed from his safer than safe diet of feasting on cruiserweights, this mode of fighting having served Foreman well when it came to ridding himself of rust from 1987 through 1989. I don’t know if anything in late 1989/early 1990( this side of Ruth Roper and her daughter) made Tyson shiver, but the neat and tidy combination punching Foreman was to show against Cooney might have made “The baddest man on the planet” wonder if a fight with the ageing former ruler was such a great idea. As for Cooney, he too was interested, at least partly, in a go at Tyson, yet his main motive for coming back was to get himself clean and sober and, as he put it, “see what I could do.” Not having ridded himself of the rust a two-and-a-half-year layoff (kid’s stuff compared to Foreman’s ten-year absence) had inflicted on his fighter’s mind and body, Gerry was soon to be ruthlessly KO’d. Cooney had a good opening round, even staggering Foreman with his lethal left hook. Guided by the knowledgeable and hugely respected Gil Clancy (who had once trained Foreman), Cooney nevertheless deviated from his game-plan. Indeed he did get caught himself, with Foreman landing some eye-catching combos in the 2nd, decking Cooney for the first time. Gerry got up on unsteady legs and Foreman walked to him and calmly pealed off a vicious left uppercut to the chin, followed by an unneeded right hand to the head. Cooney crashed hard and Foreman winked at ringside commentators Alex Wallau and Dan Dierdorf. The large crowd, which had been somewhat lukewarm when hearing the intros of both fighters, now cheered Foreman and the buzz of the demand for a Tyson fight could almost be heard inside The Convention Centre. Unfortunately – or the opposite, depending on your view of what would have happened – Foreman never got his shot at Tyson. Less than a month after he’d disposed of Cooney, “Big George” watched as huge underdog James Douglas wrecked Tyson in Tokyo, shocking the world as he did so. Would Foreman have been the first man to KO Tyson had he beaten Buster to the fight? Or would the speed and power of Tyson have been too much for the old man? To this day, I think about this particular, fight-that-got-away the most. 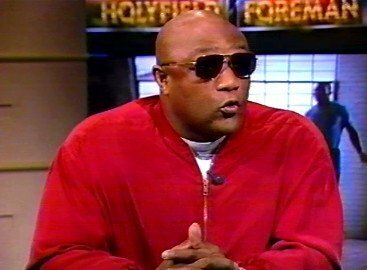 Confined to Dream Fight status for all time, Tyson-Foreman and what would have transpired still invokes debate all these years after Foreman-Cooney. Yet at one point it looked as though the “geezer” who emerged victorious on January 15th 1990 would be next in line for Tyson. @eastsideboxing When we made this match I told Arum not to get out of his seat, it was gonna be quick and not pretty.